The people of Mesoamerica are said to have used the Babylonian cubit as a standard measure in their construction projects. If true, this is another correlation between the ancient Americans and Mesopotamia, lending credence to my theory of Jaredite origins in Sumeria. Archaeologist V. Garth Norman, writing for the Ancient America Foundation (also in the Book of MormonArchaeological Forum), claims that all the ancient monuments that he has investigated in Mesoamerica appear to have been constructed using the Babylonian cubit of 49.5 cm. Norman began his studies at the site of Izapa, in Chiapas, and later studied measurements at many other sites and museums. All his measurements appeared to be consistent using a standard unit of length. Norman then goes on to correlate his findings with measurements used in Israel, which he feels link the Mesoamerican sites with the Nephites, whose origin was, of course, in Jerusalem. However, I feel it is much more logical to link the sites with the Jaredites who originated in Sumer. They would have been familiar with such standard measurements, which were probably developed by the Sumerians. The cubit measure was apparently an early invention by the Sumeria craftsmen. They subsequently passed on this knowledge to neighboring cultures. We have several examples of these ancient tools, one from Sumer, and another from Egypt. In 1916 a German Assyriologist, excavating at the ancient Sumerian site of Nippur, found a graduated copper-alloy bar. He claimed that it was an ancient Sumerian cubit measure. It measured the cubit as 51.86 cm. I have been unable to find a date for this ruler, but the site of Nippur was flourishing about 2000 BC. The second is found in the Louvre Museum in Paris. It is from the time of Tutankhamun (about 1300 BC). It measures 52.3 cm long. These measurements are not exactly equivalent to Norman's findings, however are fairly close. There seems to be a great deal of variation in reported cubit lengths measuring anywhere from 46 to 52.5 cm. 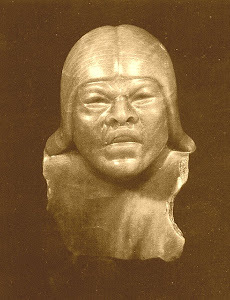 There is an excellent site dealing specifically with the cubit, it's history and the various lengths used by different groups. It can be found here. One additional item of interest from this site is the Egyptian numbering system. 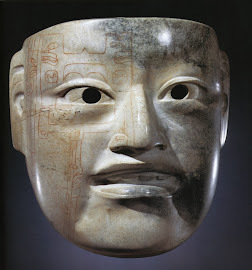 It seems to have similarities with the Mesoamerican system. The ancient Egyptian Royal Cubit was 7 palms x 4 fingers = 28 digits. This resembled the 4 phases of the Moon being roughly 7 days (~7.4 days) each. The lunar cycle is 29.53 days but the New Moon is a day of darkness. 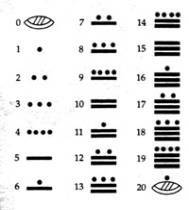 This is how the ancients determined the 7-day-week with 4 weeks in a 'moonth'. There are 12 lunar months in the 354-day lunar year. Add a 7-day-week + 4 days = 365-day solar year. Orion is 7 stars with 4 making up his shoulders & feet (Orion's Belt is three stars). The Big Dipper is 7 stars with 4 in the ladle's bowl and points toward the Little Dipper, again 7 stars with 4 in the ladle's bowl. Mars returns to the same point against the background of the stars and in relationship to Earth and the Sun every 47 years. "Anytime an idea is connected to nature, it's not only logical, it's inevitable." GOD=7_4 Theory explains why the Egyptians and Babylonians took the standard cubit of 6 palms x 4 fingers = 24 digits and added a palm to create the Royal cubit of 7 palms x 4 fingers = 28 digits. Genasis 1:1 in its original Hebrew is 7 words and 28 letters; it's God's Signature!